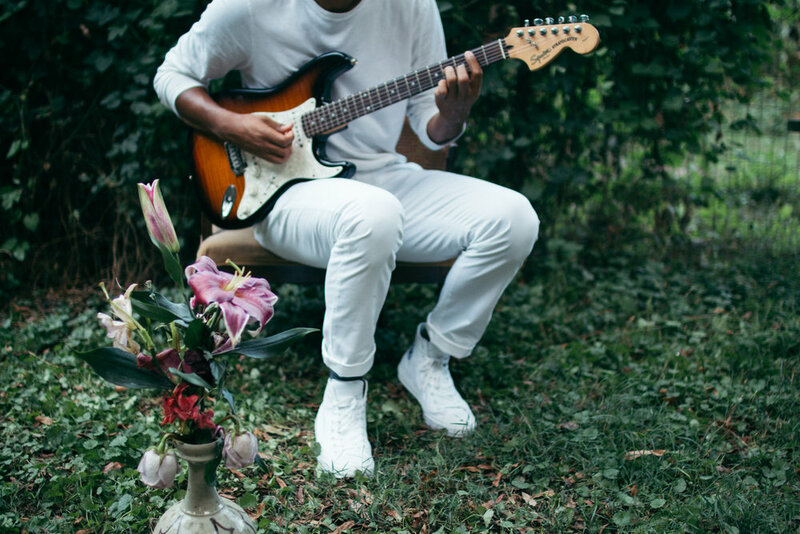 In October, when I first talked to Keenan Jenkins, the one-man band of XOXOK, he turned the interviewing tables on me and asked me what music I was into at that moment. The alternative-rock and indie punk styles I listen to are a far cry from his musical styling that closely resemble his influences of Frank Ocean, John Cale and Jeff Buckley. However, you can’t help but be pulled into Jenkins’ sweet, ringing vocals and echoing guitar chords that wax and wane throughout his tracks, no matter what music genre you prefer. Armed with a guitar, some pedals and thoughtful, provoking lyrics, Jenkins seems to have cracked the code for soulful music cultivated from a bleeding heart. Although from Carrboro, North Carolina, XOXOK frequents Charlotte for shows, most notably an upcoming one at Petra’s with Leanna Eden & The Garden Of and Iliad on Dec. 15 at 8 p.m.
Now, he just sent the final mixes of his new EP to the mastering process and plans to release it next year. Currently, it’s tentatively titled after one of his favorite tracks of the album, I was lucky enough to listen to a couple of songs, most notably “Worthy,” that he had downloaded on his phone. Backed by vocalists Connelly Crowe and Mary Koenig along with drummer, Joe Macphail, Jenkins’ vocals lay smoothly over the track. Q.C. Nerve sat down with Jenkins at Free Range Brewing on a rainy Saturday morning, shortly before a performance at Camp North End. Jenkins discussed his first time in the studio, writing the music for the new EP and his overall songwriting process. Q.C. Nerve: What’s your process for writing a new song? Jenkins: I don’t have a good answer for that. I don’t know, I have a hard time thinking about it. When someone asks me how I write songs I don’t have an answer because there’s no one way that I do it. It’s never one single process, it takes a long time for me to write a song. I could write a few chords today and then just play them over in my head and on my guitar over and over again for weeks and weeks until I come up with something else. Or I could find something in my iPhone voice memos that I wrote months ago and go, “Whoah, that would go well with something that I wrote two days ago!” So I have a hard time writing songs very quickly, they just come from random snippets. I write about my friends, what they’re going through. I write about myself, I guess. I listen to a lot of music. I think I probably said this to you before, but I say it a lot. I try to be like other musicians, and I know that I fail to do that. But in that failure, I find my own style. When I last talked to you, you said you were working on an EP, how is that going? I sent some files to mastering a couple days ago. I have final mixes on my phone right now, you can listen to them if you want to. So I’m excited about that. Is there a title for it? I think it’s going to be called Worthy, which is the name of one of the songs as well. I think I’m stuck on that. Does that mean “Worthy” is your favorite song on the EP? It’s like asking which is a favorite child. But also many people have favorite children, so yes that is my favorite song on it. [laughs] Yes. If someone wanted to hear one of my songs and they only had time to listen to one, that’s the one I would play them. Yeah, it might be my favorite one. Tell me about that song, what do you like about it? This song, to get into the weeds of it, is just C#major and F#major over and over. But I try to make then sound unique by putting riffs in there. So musically I guess it’s not that complicated of a song I just wanted to make something that sounds really nice and pretty for the most part. So I did that, and I sat there and it was 6:00, then it was 6:30, then it was 6:45. And nothing was happening. And then I realized it was going to be a pretty cloudy day, and I just stood there. It was February, it was very cold. And I just stood there waiting for this moment that would never ever come. So I wrote that down, and that was the jumping off point for the song. So, what was it like being in the studio for you for the first time? For me, it was my first time, so I don’t have anything to compare it to, I guess. It was one of the most fun things I’ve ever done in my entire life. To just be in that room and have nothing else to focus on, just the thing that I care about the most. To be in a room with other people who are like, “No, no, no, I want you to focus on this very particular guitar part or tone.” To just be around other people who are also thinking like that was really nice. I learned a lot. I learned a lot about my own songs and songwriting and how that would translate to the studio. I’ve been playing guitar since I was 15 but the guitar that I played in my room doesn’t always translate to the studio and that doesn’t always translate to a stage. I learned a lot about what makes a good recording.